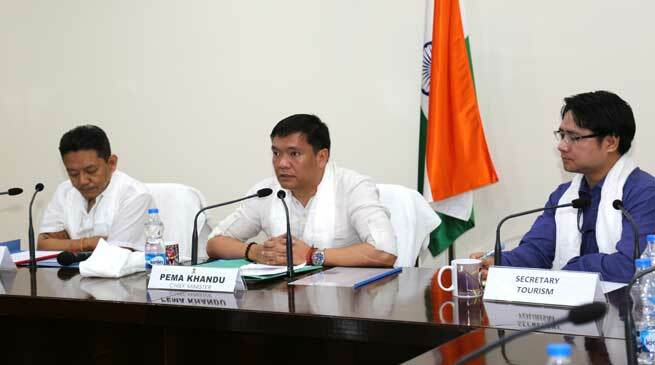 Chief Minister Pema Khandu today stressed on ‘hospitality’ as key to boost tourism industry in Arunachal at a time when the state is witnessing rise in tourist arrivals every year. “People need to be educated more in terms of tourism. Tourist comes to those places where people are friendly and welcoming,” said the Chief Minister during the launch of an audio-visual presentation on tourism promotion in the state presented by the Arunachal Tour Operators Association (APTOA). He requested the state tourism department to conduct workshops and awareness campaigns to make people realise the importance of tourism for growth of state’s economy. Stressing on innovation to promote tourism, the Chief Minister urged the young minds of the department to take the lead. He welcomed private investment in tourism industry to supplement the state government’s effort towards developing the tourism infrastructure and facilities. To help local entrepreneurs, Khandu informed that state government has announced Deen Dayal Upadhyaya Swalamban Yojana (DDUSY) with bank loan ranging from Rs 10 lakhs to 1 crore with 30% subsidy. “Main purpose of this scheme is to boost tourism and to promote the growth of Agri and allied sectors, which will be a big help for our unemployed youths,” he said. Touching on the issues of APTOA, the Chief Minister assured to raise the corpus fund from Rs 10 lakh to Rs 50 lakh within this year. Acknowledging the role of tour operators in the development tourism sector, he welcomed APTOA to be a part of Team Arunachal to help the government in policy making and decisions. The Chief Minister congratulated Kesang Lhamu Khrimey for her audio-visual presentation titled – ‘Into the mist’ and appreciated her for bringing alive the beauty of nature. The meeting was also attended by Tourism Parliamentary Secretary, Passang Dorjee Sona and Tourism Secretary, Dr Joram Beda.